Sur la base de deux événements d’inondation ayant touché récemment, dans des contextes politiques, organisationnels et hydrologiques bien différents, de nouveaux quartiers d’habitation, cet article rend compte des pratiques des acteurs impliqués dans des situations d’alerte et de crise en Suisse. Le recensement des acteurs – à travers leur rôle et leur place dans les mécanismes de préparation, d’alerte et de gestion –, ainsi que l’inventaire des documents mobilisés par ceux-ci, ont été réalisés dans les deux cas. Cette analyse a permis d’évaluer la gestion des événements, de déceler les changements organisationnels qui ont suivi les crises et de connaître la conception et le degré de formalisation du risque dont étaient dotés les différents acteurs avant et après les inondations. Plus encore, l’analyse a documenté les nouveaux processus d’alerte et de prévision qui ont été mis en place suite aux événements. Il s’avère ainsi que les épisodes d’inondation agissent de façon décisive sur la production de connaissances, à un degré variable selon les acteurs. Ces épisodes révèlent aussi parfois l’existence de connaissances « en attente » qui ne sont pas encore intégrées dans les procédures institutionnelles. Tant du point de vue de la prévision que de la gestion de la crise, ils permettent aussi de tester les canaux de l’information et de combler les déficits d’organisation, de collaboration et de sécurisation des dispositifs de communication. En outre, les risques et les crises liés aux inondations modifient les dynamiques et les politiques territoriales, conséquences du réajustement des réseaux d’acteurs. La mise en place de dispositifs d’intervention et de gestion de crise se montre cependant plus efficace que la refonte des dispositifs d’aménagement, généralement longue. Toutefois, la mémoire des événements se dégradant avec le temps, une inscription territoriale du risque s’avère nécessaire. Based on two flood events that recently affected new housing areas in very different political, organisational and hydrological contexts, this article examines the practices of actors involved in emergency and crisis situations in Switzerland. In both cases, the actors are identified – through their role and their position in the various procedures related to crisis management – and an inventory is made of the documents used. The study examines how the flood events were managed, identifies the organisational changes that followed the crises, and determines how the risk was conceived and to what extent it was formalised by the different actors both before and after the floods. Finally new forecasting and warning procedures that were set up following the events are described. The study shows that floods have a decisive impact on the production of knowledge, but that this phenomenon varies according to the actors. Events such as floods also sometimes reveal the existence of "latent" knowledge, or knowledge that is available but has not yet been integrated into institutional procedures. In terms of both forecasting and crisis management, these events also provide the opportunity to test information channels and to identify and correct any problems relating to organisation, cooperation or the reliability of means of communication. Among other things, the risks and crises related to flooding modify the dynamics and policies of the local area as a result of readjustments in the networks of actors. The introduction of emergency and crisis management measures appears more effective, however, than the reorganisation of planning and development procedures, a process which generally takes a lot longer. Nevertheless, since the recollection of events tends to fade with time, it is important that risks find a more concrete form of spatial expression on the landscape. 1Two cases of flooding that mainly affected new residential districts built on land liable to flooding (Saillon, Valais canton, 2000; Lully, Genève canton, 2002) were analysed in a study conducted within the framework of COST Action C19 “Vulnérabilité des infrastructures urbaines et gestion de crise: impacts et enseignements de cas d’inondation en Suisse” (Vulnerability of urban infrastructure and crisis management: impacts and lessons from flooding in Switzerland) (November, Reynard (dir. ), 2006)1. During this study2, prevention and warning procedures were keywords that were constantly evoked by interviewees. 2Managing risks involves perfecting monitoring methods capable of providing precise information on the situation to be managed, so that managers can decide how best to intervene. In the case of a crisis, this implies that information can be transferred in an optimum manner. However, it may happen that the information transfer chain breaks down when the situation becomes complicated, particularly when the magnitude of the event and the way it occurs do not correspond to the formalisation of the risk held by the actors involved in its management. Given the diversity of actors concerned, the multiplicity of decision levels (individual, communal, regional, national, and even international), the fact that a state of readiness tends to become toned down with time, and that land uses are subject to change, decisions taken during a given risk situation may prove to be untimely and to lack coherence. Our study therefore explored the different ways in which prevention and emergency procedures were organised, firstly in a general and theoretical manner, then on the basis of individual cases by identifying the actors involved in these procedures and the ways in which the procedures were reorganised following a crisis. 3A risk may be defined as a potential event that has not yet happened but which it is felt will result in a disastrous event (a crisis) for individuals or for a community in a given space or spaces (November, 2002). This definition is deliberately broad. It differs from that proposed in natural and economic sciences where risk quantitatively designates, within a given sector, the economic consequences (including loss in human lives) that an uncertain event could lead to if it actually occurred, the uncertain event being an instability or a process recognised spatially and qualified by a degree of danger. Our definition is, however, very close to that adopted by Callon et al. (2001: 37) for whom risk is “[…] a clearly identified danger associated with the occurrence of an event or series of events, which are perfectly describable, events that we do not know will take place but that we know are capable of taking place” (translation). 4Risks comprise several stages, from their identification (which assumes interpreting warning signs and conducting diagnoses, defining criteria and indicators) to their management (implementation of risk minimisation measures) and their possible manifestation (catastrophe or gradual reduction of risk, post-crisis management). These stages translate into both actions, involving a multitude of actors, and a process: a secure zone may become a risk zone following deterioration of protective structures, climatic changes or a transfer of risks caused by projects undertaken elsewhere whose implementation has caused cumulative effects over time that have resulted in problems (for example, increasing impermeability of soils). 5In line with this perspective, emergency alerts appear as “real tests of the monitoring and crisis management measures already in place and, at the same time, bring into play methods of interaction between the local and the global, the individual and the communal, the profane and the expert, the subjective and the objective” (translation) (Chateauraynaud, Torny, 1999: 15). As these two authors demonstrate, a crisis alert is based on monitoring, surveillance and attention and involves activation of a memory, whether the alert is in response to a phenomenon that is unfolding or to a possibility, or whether it is a response to an imminent catastrophe or the evaluation of a poorly-understood or underestimated risk. Thus, the alert is not only a question of techniques, sensors or alarms, but also the result of a process that creates a network of actors and cooperation among institutional and non-institutional authorities. “The alert takes the form of an approach, personal or collective, aimed at mobilising authorities considered to be capable of acting and, at the very least, of informing the public of a danger, the imminence of a catastrophe, or the uncertain character of a company or technological choice” (translation) (Chateauraynaud, Torny, 1999: 37). From this viewpoint, the alert is to be considered as "a capture of information". Furthermore, the alert helps redefine the territory in both an anthropological and administrative sense. This theoretical proposal is in line with a perspective of the sociology of science and techniques and pragmatic sociology which focuses analysis on the processes in progress, and the configurations and reconfigurations of the action underway. Few authors have analysed the problems of flooding along these lines, with the notable exception, however, of the work conducted by Le Bourhis and Bayet (2002). 6Saillon is a small alpine town undergoing development, where the new residential areas are situated on the flood plain of the Rhone, while Lully is in the rurban (residential) zone of the Geneva countryside. In both communities, the majority of inhabitants affected by the floods – which only caused material damage – had never experienced flooding before, but there are, however, several aspects that differentiate the two situations. Firstly, at a political level, the involvement of the administrative entities (cantons, communes) in the prevention and management of natural hazards, at least at the beginning of events, differs. Motivated by recurring critical situations (floods of 1987 and 1993, avalanches of 1999), the Valais Canton had taken measures that, in 2000, helped prepare it to face a major crisis affecting several sites simultaneously. On the other hand, at the level of the commune, the state of readiness and risk awareness are often less developed, particularly when the area (and this was the case for Saillon) has not been affected recently by an event of this type. In Geneva, the existence of hazard maps and the inclusion of the notion of natural hazards in the cantonal Master Plan had not resulted until 2002 in a factual and immediate consideration of the risks threatening Lully, either by the commune or the canton. 7Next, the hydrological context is also different (deferment of flooding following a breach in the dyke in Saillon, concentration and insufficient evacuation of run-off in Lully). 8The magnitude of the crises also differed in the two locations. Almost the entire Valais canton had suffered the consequences of very heavy rainfall for more than 24 hours (breaches in dykes, overflows, mudflows, landslides), while in Lully the event was isolated. Finally, the two areas differed with respect to the recurrence of flooding: similar situations had occurred several times in the recent past in Lully, the last time being in 2001, while in Saillon, the last time the alluvial plain was flooded by the Rhone was more than 50 years ago. 10(1) the overflow of the Rhone whose first bottomland is several metres above the level of the plain, (2) a lateral tributary crossing the plain upstream of Saillon, (3) karstic exsurgence downstream of the area of Saillon, (4) rise in groundwater to surface level in the lowest points in the plain, to which was added (5) the risk of a breach in one or other of the major alpine hydro electrical power dams. But the origin of the flood in 2000 was elsewhere. 11Heavy rain affected the southern part of the Valais canton from 12 October 2000. In certain cases, river flow rates, like the rainfall in the most affected areas, reached levels corresponding to return times of more than 1000 years (BWG, 2000). As early as the morning of October 15, the firemen in Saillon were monitoring the Rhone following an alert issued by the headquarters of the CECA (Disaster Unit of Valais canton). A breach in the dyke occurred around at 1.30 pm, a few kilometres upstream (Figure 1). In Saillon, the river flow rate decreased by about 20%. The Rhone plain has been naturally divided up by the lateral tributaries of the river and their alluvial cones. However, the drainage canals pass under these tributaries and weaken the sections. Thus it was via these canals that the flood of 2000 crossed two sections before reaching that of Saillon seven hours later (Figure 1). Because of a lack of communication at the cantonal level, the little town of Saillon was not officially informed of the breach in the dyke. When the firemen still on duty noticed the flooding of the preceding section in the early evening, it was then too late to take preventive measures. As the Saillon plain became flooded by the overflow from the drainage canal, the firemen evacuated the zones affected. Cellars and even the inhabitable parts of numerous buildings were invaded by the water. Figure 1. Flooding of the Rhone plain in the three successive sections of Ardon-Chamoson, Leytron and Saillon. The triangles represent the breach points firstly in the Rhone dyke in the first section, then in the Leytron section of the dyke for the Sion-Riddes canal. This canal, near the Rhone, evacuates water from the Ardon-Chamoson section. The Saillon flood plain is then flooded by the overflow from a second canal that drains water from the Leytron section. 12While the Valais canton has several measures, such as a law concerning organisation in the event of a catastrophe, and authorities for managing a flood event (CECA, CERISE (Crisis scientific unit) etc. ), the town of Saillon has no coordinating body. To organise emergency teams (firemen, disaster and emergency services), the town creates a local crisis control centre as and when required. The management of information flows to the local population and the lack of personnel were among the main difficulties the town had to face during the floods. 13Difficulties and operational problems during the event resulted in a certain number of measures being introduced at both the canton and the town level. Thus the canton defined responsibilities and information flows by preparing a Rhone emergency intervention plan. In addition, it created the Section organisation, planification et prévention en cas de catastrophes (Department in charge of organisation, planning and prevention in the event of catastrophes) which is now responsible for advising communes and for training local crisis control centres. The town of Saillon has identified the lessons to be learned from the flood, particularly with regard to preparations for future catastrophes and flood protection measures. It has set up a local crisis control centre and introduced regulations for organising the commune in the event of disasters or extraordinary situations. In addition, it has prepared plans to provide for protection against flooding and renaturation of the rivers affecting the commune. 14The second flood studied occurred in the lower part of the village of Lully (Bas-Lully) in the commune of Bernex. Three sources of vulnerability had been identified in the flood plan. Until 2002, the main threat was considered to be the neighbouring river, the Aire, whose banks rise above the average level of the recent residential sector of Bas Lully. However, this sector is located at the outlet from a sub-catchment area of the Aire, which today is without a natural drain, and corresponds to the zone where runoff accumulates, runoff which has difficulty in draining away when the Aire is in flood (Figure 2). Finally, the last hazard comes from the relatively high level of the surface aquifer in the flood plain of the Aire, which at this point is above the bed of the river. It is the runoff that led to the flood of 2002. Figure 2. The Lully flood: location map. (a) indicates the position of the outlet in the Aire of the main drain from the Lully plain. 15The lower part of Lully was designated for building in 1954 and underwent a certain amount of development from the 1970s onwards. The development plan adopted in 1982 mentioned a flood risk, without specifying its nature or how it might be protected against. The only flood threat taken seriously by the authorities was that posed by the Aire, a danger made more tangible by the publication in 2000 of a map of flooding risks on this river. In 2001, two residential blocks were built, each equipped with inhabitable basements, despite the fact that the use of basements for residential purposes had been prohibited by cantonal law (Tanquerel, 2003). In March 2001, the excavation works were inundated by runoff waters. This event led to the construction of a new main sewer for clear water, completed too late, however, to avoid further flooding in 2002. 16At that time, no Genevan government department was really responsible for dealing with runoff waters. Furthermore, applications for building permits were not systematically transmitted to the services competent to identify this risk. In addition, the recent map of flooding risks on the Aire had not yet been integrated in planning and development procedures. 17The floods of 2002 were due to heavy precipitation (> 90 mm) which occurred in two episodes, first during the day of 14 November, then in the night of the 14 to 15 November. The return time of this precipitation was about 120 years (MétéoSuisse / Swiss Meteorological Office). The water intercepted by the drains in the agricultural zone upstream could not be correctly evacuated: the drainage network and its main sewer became saturated and their outlet was blocked by the Aire in flood. Thus runoff flowed along the surface and reached Bas-Lully (lower part of the town) on 15 November between 3 and 4 o’clock in the morning, surprising many residents in their sleep (Figure 2). 18The alert threshold was fixed by MétéoSuisse at 50 mm of rainfall in 12 hours, a threshold that was not reached in the first episode. Estimating that the second episode was not going to affect Geneva, MeteoSuisse gave no warning. In Lully, despite firemen being present in the afternoon of the 14 November, and even a short time before the flood, the residents were neither alerted, nor evacuated. The emergency services present did not expect an event of such intensity. Some residents who were sleeping on the lower floor (basement section) of their homes were surprised by a flood of water that entered as the basement windows, installed in ditches to allow light into the lower floors, broke. The basements of the recent constructions were completely flooded. 19Given that the area affected was limited in extent, the difficulties encountered during the event concerned more the forecasting of the crisis than its management. Thus, after the event, the chief fireman of the city of Geneva observed that it was better to exaggerate the means employed to intervene, than to under-estimate the risk. It would be better in the future to apply a sort of principle of precaution in emergencies. 20The aim of the “Cellule d’intempéries pour Genève” or CIGE (Bad Weather Unit), set up by the cantonal authorities in December 2004, is to interpret the forecasts of MétéoSuisse during critical weather conditions. The unit includes representatives of both the disaster and emergency services and the cantonal services. Following the event, the regional alert thresholds of MétéoSuisse were redefined: an accumulation of 50 mm in 24 hours was fixed for the Alps and the northern Alps. It was reduced to 30 mm for the Lully sector. In addition, cantonal authorities, in conjunction with the fire brigade, prepared a cartographical index of water damage that had required the intervention of emergency services. 21In the commune, a telephone answering machine was introduced. This uses three levels of emergency to inform the local population, at any time, of the imminence of danger. The Association Vivre à Lully (AVAL), created a few days after the flood of 2002, was set up with the aim of ensuring better protection for the district. Enjoying the participation of the majority of local residents, this association has become one of the main representatives of the canton regarding safety measures for the village. Groups of residents regularly practise implementing an emergency plan at the scale of their housing estate: in the event of danger, sliding panels will be installed in front of the houses to prevent water from entering. 22Despite the different contexts of the floods affecting Saillon and Lully, several common points emerge from an analysis of the practices of the actors involved and the conditions under which the existing monitoring and crisis management measures were put to the test. 23Flood events serve a purpose in that they provide new knowledge (table 1). The knowledge of the majority of the actors interviewed was substantially increased. For most residents, since neither the authorities of the canton or the commune were involved in water matters, the change was profound. For others, such as the representatives of Genevan government departments concerned with water management, it was more a question of updating or adapting already existing knowledge. Finally, only the knowledge of a limited number of actors (farmers and market gardeners, representatives of cantonal departments responsible for river engineering works) was confirmed by the events and was only subject to a few modifications. Compared with the situation before the floods, the state of knowledge of the different actors became more homogenous after the events. In addition, recurrent flooding in the Valais area has confirmed the need to review river management concepts – the Third Rhone correction project (Canton du Valais, 2000) – by associating all expertise de facto related to the management of the same territorial entity. Table 1. Four scenarios for modifications to knowledge. November V., Reynard E. (dir. ), 2006. 24Our research also indicated that there is often information that is “pending” or "latent" , in other words information that has not yet been assigned to a precise legislative or administrative framework. Such was the case with the hazard map for the Aire river, which although official had not yet been integrated in the planning and development procedures for the area. Certainly, the legitimacy of the hazard maps as a planning tool was recognised in the Geneva Master plan issued in 2001, but the cantonal legislation was still only at the project stage and its method of implementation was non-existent. The publication of studies is thus often followed by a certain gestation period before such studies are used for planning purposes. The occurrence of a disaster in fact accelerates the process but does not necessarily result in its conclusion. It is here that the concept of “prise” (Bessy, Chateauraynaud, 1995; Berque, 2000), based on the idea of "affordances" introduced by the psychologist James J. Gibson (1977), helped us to illustrate this special situation: several sources of information are available (affordances), but have not (yet) been integrated (entered) in the institutional planning and prevention measures. 25In addition, the flood helped to reassess the importance attributed to certain actors, whether human or non-human. New alliances form and stabilise for a short time (Callon, Law, 1997; November, 2002). The flood also resulted in more discerning evaluations of the risks affecting the local area. What had been a familiar environment and living space was henceforth considered as a potential generator of risks. This aspect has also been mentioned in other Swiss and European studies (Peltier, 2005; Laganier (ed. ), 2006; Gruntfest, Handmer (ed. ), 2001). Thus in Saillon this change in perception is encouraging the commune to protect itself against other types of risk threatening the commune (landslides, avalanches, state of drinking water reservoir, etc.). Furthermore, the understanding of such risks makes it indispensable to reorganise prevention (planning) and management (forecasts, intervention) aspects. In Lully, cooperation among the residents helped to set up an association that within a few weeks became a major voice in defending their interests. In the same way, in the area of hydrological forecasts, the flood confirmed the effectiveness of steps taken sufficiently early. More specifically, it is most important to be able to anticipate the consequences of a rainfall event forecast at the level of the catchment basin. Thus the challenge facing the CERISE and CIGE units is to combine meteorological and hydrological knowledge so that the emergency services are able to anticipate and plan their intervention more effectively. 26Warning conditions appear very similar in both these situations: the consequences of an event have to be considered as major for one or a series of protection measures to be undertaken. The consequences of the “first” event of 2001 in Lully were considered to be too limited to warrant carrying out more detailed investigations when the area was developed for housing – when in fact they would have undoubtedly helped to minimise the affects of the flood in 2002. The monitoring and crisis management measures were not changed in any way on this occasion. Thus the simple availability of knowledge of hydrological phenomena does not necessarily lead to protection and prevention measures being taken. The risks must be identified as such and considered by the actors to be relevant for them. 27These case studies illustrate how a hazard alert puts existing crisis management and monitoring measures to the test, and subsequently contributes to their reorganisation, at least in part. 28Furthermore, our analysis demonstrates to what extent flood events act in a decisive manner on the transformation of risk knowledge. Understanding and awareness of the phenomenon is heightened in fact in every case, although to a lesser extent for those actors who have already been confronted with similar events in the past. This is also the case for knowledge mobilised by the flood. This may exist before the event at administrative levels, without it having been taken into consideration in institutional procedures. Activation of such knowledge becomes accelerated following a catastrophe. 29Finally, risks and crises related to flooding result in changes to local policies and processes, a consequence of the readjustments to local networks of actors. However, recollection of the risk fades with time, hence the need for it to be integrated in some concrete form in the landscape. In this context, it has been shown that the setting up of measures for crisis management and the intervention of emergency services is often more effective than the reorganisation of planning and development procedures, which can only be deployed if the political will is there and over a relatively long period of time. BERQUE A., 2000. – L’écoumène : introduction à l’étude des milieux humains. Paris, Belin. BESSY C., CHATEAURAYNAUD F., 1995. – Experts et faussaires : pour une sociologie de la perception. Paris, Métailié. BWG, 2000. – Hochwasser 1999. Analyse der Ereignisse, Studienbericht Nr. 10, Bern, Bundesamt für Wasser und Geologie (BWG). CALLON M. et al., 2001. – Agir dans un monde incertain : essai sur la démocratie technique. Éd. du Seuil, Paris. CALLON M., LAW J., 1997. – "L’irruption des non-humains dans les sciences humaines" . In REYNAUD B., Les limites de la rationalité, Les figures du collectif. Colloque de Cerisy, Paris La Découverte, pp. 99-118. CANTON DU VALAIS, 2000. – Troisième correction du Rhône. Sécurité pour le futur. 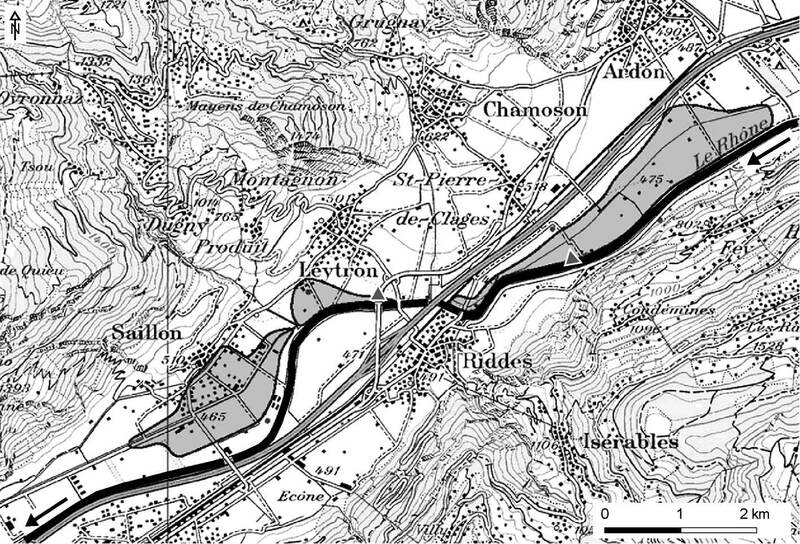 Rapport de synthèse, juin 2000, Sion, Service des routes et des cours d’eau du canton du Valais. CHATEAURAYNAUD F., TORNY D., 1999. – Les sombres précurseurs : une sociologie pragmatique de l’alerte et du risque. Éditions de l’École des Hautes Études en Sciences Sociales. CSD/HYDROGEO, 2002. – Inondation du quartier de la Léchaire à Lully des 14 et 15 novembre 2002. Genève, Département de l’intérieur de l’agriculture et de l’environnement (DIAE) du canton de Genève. GRUNTFEST E., HANDMER J. (ed. ), 2001. – Coping With Flash Floods. Nato Science Series. Series 2. Environmental Security, vol. 77, Kluwer Academic Publishers, Dordrecht. LAGANIER R. (ed. ), 2006. – Territoires, inondation et figures du risque. La prévention au prisme de l’évaluation. L’Harmattan, Paris. LE BOURHIS J.P., BAYET C., 2002. – Écrire le risque. Cartographie du danger et transformations de l’action publique dans la prévention des inondations. Rapport et monographies, CNRS – Ministère de l’Écologie et du Développement Durable. NOVEMBER V., 2002. – Les territoires des risques. Le risque comme objet de réflexion géographique. Peter Lang, Berne. NOVEMBER V., REYNARD E. (dir. ), 2006. – Vulnérabilité des infrastructures urbaines et gestion de crise. Impacts et enseignements de cas d’inondation en Suisse. Rapport final élaboré dans le cadre de l’Action COST C19 "Proactive Crisis Management of Urban Infrastructure". OFEG, 2002. – Les crues 2000. Analyse des événements, cas exemplaires. Rapports de l’OFEG (Office fédéral des eaux et de la géologie), Série Eaux, Nr. 2, Berne. PELTIER A., 2005. – La gestion des risques naturels dans les montagnes d’Europe occidentale. Étude comparative du Valais (Suisse), de la Vallée d’Aoste (Italie) et des Hautes-Pyrénées (France). Thèse non publiée. Université Toulouse le Mirail. TANQUEREL T., 2003. 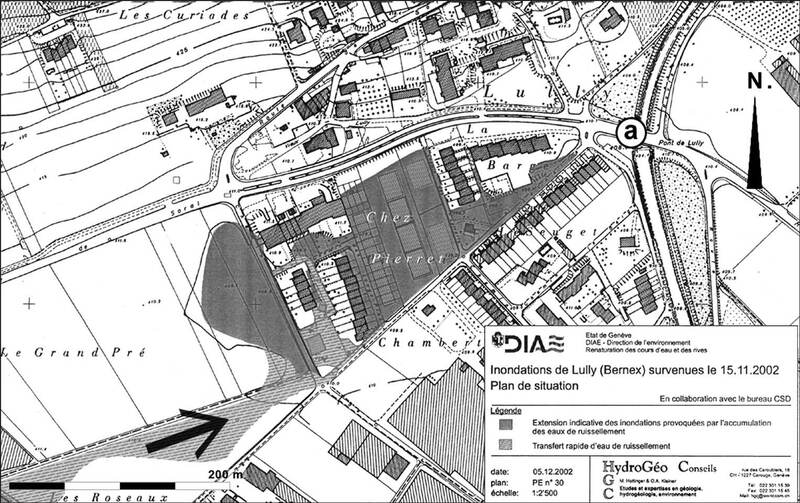 – Rapport d’enquête sur les inondations du village de Lully des 14 et 15 novembre 2002. Rapport d’enquête commandé par le Conseil d’État du canton de Genève. 1 The research team comprised the authors of this article together with Emmanuel Reynard (Université de Lausanne), Louis Boulianne (CEAT-EPF Lausanne), Jean Ruegg (Université de Lausanne), Marc Zaugg (Université de Zurich), Luzius Thomi (Université de Lausanne) and Caroline Barbisch (EPF Lausanne). 2 After consulting the necessary documents to gain a better understanding of the two cases, almost forty indepth interviews were conducted with various actors concerned by the events. Interviewees were contacted either because they were victims of the flooding or because they were professionally involved in the field of flooding (planning and development, rivers department, etc. ), whether it be at the level of prevention (disaster and emergency services, for example) or action (professional firemen). We conducted semi-directive interviews, using the same questions in both case studies. Interviews were recorded and transcribed. Valérie November, Reynald Delaloye et Marion Penelas, « Crisis management and warning procedures », Revue de Géographie Alpine | Journal of Alpine Research, 95-2 | 2007, 84-94. École Polytechnique Fédérale de Lausanne (EPFL). Département de Géosciences, Géographie, Université de Fribourg.